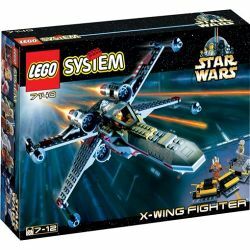 7140 X-Wing Fighter was one of the first sets to be released in the Star Wars line. It was originally released in 1999, and saw a re-release in 2002. It features the eponymous X-Wing, as well as a Utility Train that contained 6 tools. Also included were R2-D2, Luke Skywalker (Rebel Pilot) with a lightsaber, Biggs Darklighter, and a Rebel Mechanic minifigures. This X-Wing Fighter appeared on the front of a LEGO catalog. The instruction booklet had a mini comic at the end that shows Luke crash on Dagobah, where he met Biggs and the Rebel Mechanic. The comic included alternate creations that could be made with the X-Wing Fighter: a sort of jetboat whose "cockpit" could be ejected as a smaller jetski; a human-scale cellphone-like communicator; a two-legged mech; a long, narrow spaceship; and a human-scale lightsaber handle. This set was re-released as 7142 X-Wing Fighter. This is the first Star Wars set ever released. This is a description taken from LEGO.com. Please do not modify it. Fly the X-Wing with Luke Skywalker! Facts about "7140 X-Wing Fighter"
This page was last edited on 9 January 2016, at 20:33.